Prime Minister Narendra Modi kick starts Bihar’s election campaign with NDA’S “Sankalp” rally in Patna, along with ally Janta Dal (United) chief and state Chief Minister Nitish Kumar from the historic Gandhi Maidan in Patna, for the first time since 2009. 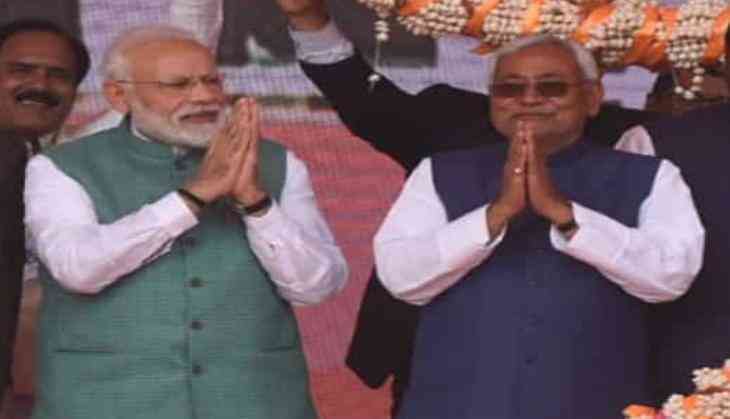 Nitish Kumar further added, “Assure PM Modi that we will win all 40 seats for him in Bihar.” When PM Modi came to the addressSankalp rally in Patna, Crowd chants "Bharat Mata ki Jai" along with PM Modi. “I salute the martyrs of Pulwama, the whole nation is standing with the families of the jawans,” PM Narendra Modi said. This is PM Modi’s second visit to the state within a fortnight, the first being on February 17 in Begusarai, from where he inaugurated and launched projects. “We welcome his return and want to thank and congratulate the PM over the manner in which he raised the matter at world forum. The world has united against terrorism,” Bhupendra Yadav, BJP MP and the party’s in-charge of Bihar said on Saturday. After Sankalp rally, PM Modi will head towards Congress chief Rahul Gandhi at his bastion - Amethi - in Uttar Pradesh.